Dr. Hamm-Alvarez received a B.A. in chemistry from Carleton College in 1986 and a Ph.D. in biochemistry from Duke University in 1990. After completing a 3-year postdoctoral fellowship in cell biology at Duke University, she joined the faculty in the Department of Pharmaceutical Sciences at the University of Southern California as an Assistant Professor in 1993. Dr. Hamm-Alvarez has joint appointments in the Departments of Physiology and Biophysics and Ophthalmology in the Keck School of Medicine. Her research program focuses on characterization of membrane trafficking events facilitating regulated secretion of proteins through transcytosis and exocytosis in epithelial cells, as well as endocytosis of macromolecules and ligands. A particular area of emphasis is the elucidation of processes that mediate the sorting, packaging and release of tear proteins by the acinar cells of the lacrimal gland. A significant emphasis of her work is the discovery of the pathological changes in membrane trafficking mechanisms in lacrimal gland acinar cells that may contribute to the autoimmune dacryadenitis characteristic of Sjögren’s syndrome. This work, ranging from fundamental cell biology, to animal, and to clinical studies, has led to the discovery of putative tear biomarkers for identification of Sjögren’s syndrome patients with early stage disease. Her group is also working on novel drug delivery strategies for targeting of immunomodulatory agents to lacrimal gland and ocular surface tissues utilizing protein-based targeting of nano particles. Finally, her work on pathological changes in exocrine tissue in Sjögren’s syndrome has identified potential additional targets for drug therapy, which have opened up the potential to explore the efficacy of a variety of new therapeutic agents for treatment of autoimmune exocrinopathy. 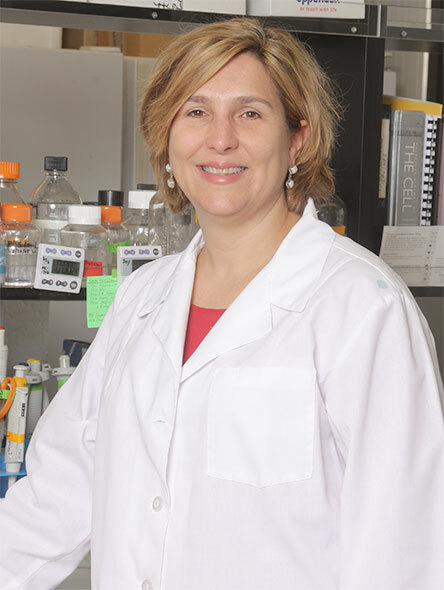 Her research program is associated with extensive usage of high resolution molecular imaging techniques including confocal and multiphoton microscopy, intravital microscopy, electron microscopy as well as histology and other biochemical techniques (membrane fractionation, molecular biology) for studying intracellular trafficking processes. She has authored numerous papers and reviews in the areas of membrane trafficking in epithelial cells, lacrimal gland and ocular surface and advanced drug delivery, and provides related expertise as a reviewer to a variety of journals and grant review boards. She has been the continuous recipient of NIH funding since 1994.